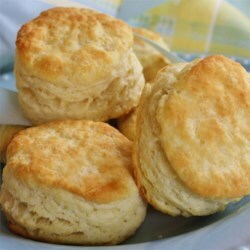 'Made these & "Buttermilk Biscuits I". I liked the other ones better. These were okay, but need some tweaking to be better than that. The flour, shortening, buttermilk ratio seemed near perfect. Often, much more flour is required than the recipe states; but not this one. Nice change. These have a beautiful golden finish, btw.